The country’s new Prime Minister and Deputy Prime Minister have claimed that free market capitalism is failing New Zealand. Their comments fly in the face of how most respectable world leaders regard private capital and free markets. Capitalism is the driving force of all successful economies. By making goods and services that people need, a nation’s entrepreneurs earn reward, create jobs, and generate tax revenue for their government. For a market economy to work consumers must have the freedom of choice and the transactions must be voluntary, so that both parties are better off as a result of the exchange. In comparison, in state controlled systems, decision-making is underpinned by compulsion and the fear of sanctions for non-compliance. While most leaders are sensible enough to recognise the social benefits of private capital, accepting that it is more efficient having the private sector pursue wealth creation than the state, our new government has a different view. They appear to believe that higher taxes and their intervention will deliver something far more utopian. Their comments also indicate that they may try to blame areas of government policy failure on capitalism. So if the Prime Minister wants to attribute blame for child poverty and homelessness, then she should focus on the government policy that is causing it. When Jacinda Ardern says there are ‘hundreds of thousands of children living in homes without enough to survive’, she is undoubtedly largely referring to the 180,000 children who live in families entrenched in long term welfare dependency. But intergenerational welfare dependency is a policy failure, not a market failure. For the able-bodied, the welfare system was designed to provide short-term assistance in times of need. The fact that families with children have become trapped on welfare shows that the policy is failing to move beneficiaries into work. With sole parenthood and long term welfare dependency known to be two of the most serious risk factors for children, Jacinda Ardern is not wrong to be concerned. However, more welfare is not the answer. The only sustainable way to lift these children out of poverty is to help their parents into work. Reforming the welfare system – to take a social investment approach – has been a major focus of the National Government over the past nine years. While progress has been made, the dependency numbers remain high. As of September, more than a quarter of a million working-age New Zealanders – 277,220 to be exact – are receiving a main benefit. Of those, 120,726 are receiving Jobseeker Support, 59,502 are on Sole Parent Support, 92,847 receive Supported Living Payments, 1,878 receive Young Parent Payments, and 2,267 receive other benefits. In other words, the vast majority of those New Zealanders that the Prime Minister claims have been failed by capitalism have, in fact, been failed by the welfare system. Once the welfare changes agreed with the Green Party in their confidence and supply deal with Labour take effect, Jacinda Ardern’s Government will begin making the problem much worse. Those changes will remove some of the sanctions that encourage work-tested beneficiaries to take jobs. Unpalatable though it might be to the Prime Minister and her new Government, the stark reality is that the more comfortable welfare becomes, the harder it is for beneficiaries who are capable of working, to move into jobs. And the longer their children are trapped in the dangerous state of long-term welfare dependency. The new Government will make the problem even worse, once they introduce New Zealand First’s policy concession to increase the minimum wage to $20 an hour. According to the Ministry for Business, Innovation and Employment – which reviews the impact of minimum wage increases on the wider economy – increasing the minimum wage to $20 an hour, could destroy over 60,000 jobs, it would significantly increase the economy wide cost of wages by over $2 billion, with the cost to the government alone far exceeding $500 million. In other words, these changes will disproportionately harm the most vulnerable job seekers, as those with few qualifications and skills will find it increasingly difficult to find employment. With the minimum wage at $20 an hour, many low skilled workers are likely to become dependent on a benefit on the long term, because the government will have priced them out of the market. And once the unions gain the additional powers promised by Labour, this problem will only get worse, as wages will be forced even higher. In criticising free market capitalism, Jacinda Ardern also claimed that New Zealand has the “worst homelessness in the developed world”. The Prime Minister knows that the homelessness statistics she quoted have been discredited as ‘fake news’ – yet she continues to use them, because it suits her agenda to do so. The point is that it’s not capitalism that is creating most of New Zealand’s serious social problems – it’s government policy failure – in particular, where policy interventions have prevented the free market from operating. This is certainly the case with the housing shortage. The problem was caused when local councils embraced the environmental activist agenda and put urban boundaries in place to prevent urban sprawl. This effectively prevented new house builds being able to keep up with demand – especially when by the excessive delays and costs associated with the dysfunctional Resource Management Act were factored in. As well as criticising capitalism in his coalition announcement, Winston Peters also talked down the economy – no doubt trying to absolve New Zealand First from any responsibility for future downturns brought about by the policies of the new Labour-Green Government. National has vastly improved our economic outlook, and made some progress on welfare reform. It would indeed be foolish if, the new government were to reverse those gains. “Notice that the justification Peters gave for his decision to install what is in effect a Labour-Greens-NZ First government is that the ‘voters had voted for change’. Of course a moment’s thought reveals just how vacuous such a supposed justification really is – how many NZ First voters do you think wanted the Greens running the country or wanted a 37 year old Prime Minister? “You might think he was crazy to put in office a woman who said, and appears to believe, that ‘capitalism has failed New Zealanders’ – good luck pointing to any other economic system yet devised that delivers even half the wealth and prosperity. Already the new Prime Minister is talking about changing the way the new government will measure economic success – away from economic growth towards including such things as people’s ability to lead a meaningful life, their enjoyment of life, and whether their income is enough to support their family. But in spite of saying she is concerned about people’s wellbeing, one of the first tasks for the new Labour-NZ First-Green Government will be cancelling tax cuts that would improve the lives of 1.3 million families. The tax cuts, which are due to come into force in April, to provide working families with around a thousand dollars of extra earnings a year, were passed into law by National – with the support of New Zealand First and the Greens! By cancelling the tax cuts, Labour, New Zealand First and the Greens are now saying that they know better than the families that earned the money, how it should be spent. ‘The government knows best’ is undoubtedly the new the mantra that will ‘give capitalism a more human face’. 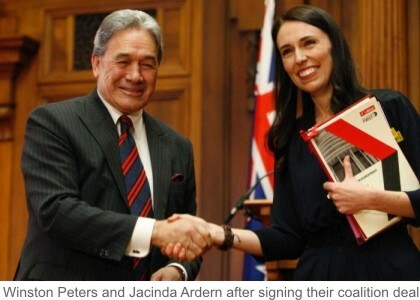 Meanwhile, the coalition agreements have now been signed – the Labour-New Zealand First Coalition Agreement can be seen HERE and the Labour-Green Confidence and Supply Agreement HERE – and Cabinet Ministers have been sworn in – the full list can be seen on the Cabinet Office website HERE. While the Prime Minister has not as yet announced the start-date for the new Parliament, by law it must be within six weeks of the confirmation of the official election result – making the last possible date the 23rd of November. For the State Opening, the Governor-General will summons together new Members of Parliament to take their oath of allegiance to the Crown and elect a new Speaker. It is the following day, when the Governor-General delivers the Speech from the Throne, setting out the new Government’s legislative agenda that we will better understand what lies ahead. We will know whether the promised change in direction will take the country backwards through higher taxes and more government spending, or forwards, through a transformational shift towards a higher value export economy that has the potential to change New Zealand’s future in a very positive way. Do you believe intergenerational welfare dependency is a policy failure or a market failure? Free ride through life is now expected by up to three generations in some cases. Why? because they have known nothing else.. Why can so many NZrs not afford a house for themselves now? Too many Immigrants. Why do we have so many immigrants? Because they are needed for the jobs that the local population are too damn lazy to do. Solution; no reward for no effort. Socialist Governments only survive by penalising those with incentive & work ethic, to support the no hopers who they pay & can control… A.G.R.